Draumr Kópa moved to Wordpress! You might be wondering why there haven't been that many posts these last weeks. Or maybe you follow me on Twitter and you already have a clue about what's going on. 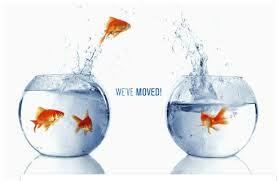 The reason is pretty simple: I moved Draumr Kópa to Wordpress! It has been a bit of a struggle to get everything in the right place and there's still lots of work to do, but as I'll be posting all new blogposts over there, I wanted to redirect you guys to the Wordpress blog, so you won't miss a thing. I kept the lay-out simple for now. As soon as I get the hang of it and have some more time on my hands I'll be trying to create a new look for Draumr Kópa. I'm really glad I did this switch, because I had some difficulties with blogger lately and as I'm not the most patient person I was ready to throw my laptop out the window out of sheer frustration. Luckily Wordpress doesn't have these problems and working with it has been quite pleasant. I hope you'll all enjoy the new website! There are still some things under construction, but those will be fixed by the end of the week. Thanks for reading and hopefully I'll see you on Wordpress! Kyri Vantage’s parents were murdered – by forces unknown but powerful. Her brother Rion was killed five years later, when he seemed on the verge of learning what had happened that night, even though he was an agent of Myrionar, God of Justice and Vengeance. And when Kyri herself discovered the truth, she became the only chance for her family to see justice done – and the last, fragile hope for a dying god. But that was only one of the disasters facing Zarathan, as the world began to be enveloped in treachery and war, and two others took their own paths which would eventually collide with hers: Tobimar Silverun, Seventh Prince of Skysand, exiled on the turn of a card and a prophecy, seeking a homeland lost to evil and time; and Poplock Duckweed, an unlikely hero whose diminuitive size was as much weapon as it was weakness. As rulers are murdered and countries beseiged, three stories converge into a single confrontation which may determine the fate of Zarathan itself. 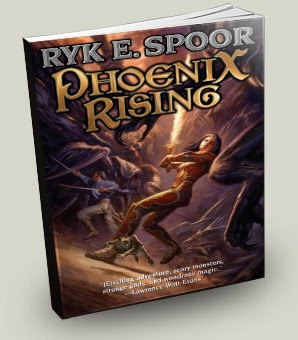 I’m really glad I had the opportunity to read “Phoenix Rising” as it was a highly enjoyable read. I had never heard of the author or the book before and starting a book you know next to nothing about is always a bit of a jump in the dark. The first few chapters, though a good introduction to the rest of the story, were a bit tough because the customs and magic in this elaborate world the author created are really complex and detailed. But throughout the book we get to know the different sorts of magic and religions a bit better and the reading experience gets a lot more comfortable while the story progresses. It’s actually quite impressive how imaginative, original en elaborate the author made his world. Ryk E. Spoor has also created a wide variety of characters that bring an exotic touch and interesting diversity to the story. The people who have been following my blog for a while will know that I love a Fantasy tale about a quest. I was therefore really excited when I noticed this story revolved around several quests: definitely my cup of tea! This mixed with an intriguing magical system, vengeance, ancient creatures, evil and horrifying enemies, corruption and secrets is definitely a recipe for a wonderful Fantasy story. The characters were so-so, Kyri and Tobimar were OK, but didn’t pull me in as much as Poplock did. Poplock Duckweed is one of the most surprising and funny characters I’ve ever read about. The first chapter where Poplock takes center stage we don’t immediately know what he is. With all the interesting characters in this story he could be anything. But I was so surprised when I found out what he was I actually told my mum about it. He is a most unusual hero, but very entertaining to read about! The writing is very compelling and easy to read. There are just some minor remarks I had: the names the author chose were sometimes a bit too difficult. I understand this was a conscious decision on some occasions but I don’t even try to read those names. It puts a kink in the reading experience and I just skip them whenever they get too hard. On the other hand, it gives a good example of the differences between the several populations and their languages and customs, so a bit of a dilemma there. Also, and this is something I’ve been seeing a lot lately, there are a lot of italics in this book. Some of them are necessary, like when we’re listening to what some of the characters are thinking. But if it’s to emphasize certain words I don’t think that’s always necessary, I like to put my own emphasis on words while reading and being forced to do it really irritates me sometimes. Luckily it wasn’t that big of a problem here, just sporadically it could have been a bit less. I absolutely enjoyed “Phoenix Rising”, it was an entertaining, elaborate and complex story with a strong backbone and a lot of action, magic and cultural diversity. I’d recommend it to any Young Adult or Adult with a love for Sword and Sorcery and quests. Hi everyone! I'm back! Exams are finished and I now have some free time to do whatever I want to do. Off course, there'll be a lot of reading going on in those free moments (especially since it's raining outside), but I have to tell you right away that in two weeks time there'll be another 10 days of silence here. Why is that? America, baby! I'm exploring the East Coast for 10 days and I leave the 4th of July. This is my first trip to the USA and I'm really excited about it. But for now, let's catch up on some blogging. 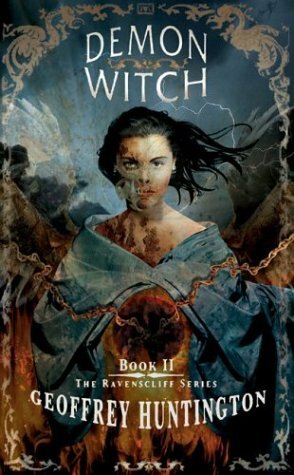 In my last blogpost I already mentioned a YA Fantasy/Horror series I absolutely adored when I was younger. "Ravenscliff" has always had a special place on my bookshelf, but I'm sorry to say that the fact that I loved reading it as a teenager isn't the only reason for this. There are currently 3 books in the Ravenscliff series and I devoured every single one of them. I'm actually surprised they aren't falling apart yet, because I must have read them numerous times. The thing that's been bugging me all this time (I read the last book in 2006) is the fact that the story isn't finished. The last book "Blood Moon" ends on a HUGE cliffhanger. The years after I read "Blood Moon" I eagerly awaited the 4th book. I was a regular customer in the little bookshop here in town and I kept asking them if they knew anything more about the 4th Ravenscliff book by Geoffrey Huntington. I got the same answer every time I asked. "No, no word on a 4th book, I'm sorry". I searched the internet but couldn't find anything to indicate a follow-up for "Blood Moon". 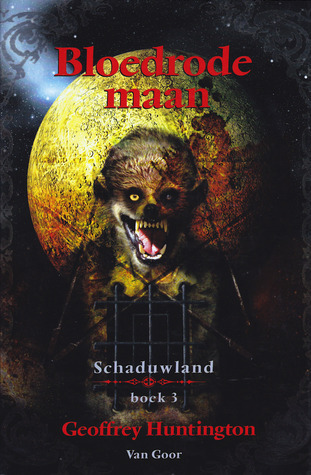 I actually found out that the English readers hadn't even had the chance to read the third book, as it was only published in Dutch and French. I guess there are some advantages to speaking Dutch after all. After a few more years I sent a rather angry e-mail to the author and gave up. Earlier this month I was checking my inbox when suddenly one of the names of my unopened e-mails caught my attention. "Geoffrey Huntington". My first reaction was: NO WAY!, my second was: Oh my, I hope I wasn't as rude as I remember in the e-mail I sent him years ago. I know I can get all wound up about books, especially if I love them and I was a teenager... Says enough I guess. But the e-mail contained some news, some great news about the Ravenscliff series. The first three books will be relaunced by Diversion Books as e-books and if this goes well, there is the prospect of another 7 books in the series! I actually let out a little shout when I read this. Finally, after all those year, I'll know who's standing in the doorway at the end of "Blood Moon". I would love it if kids today would rediscover the tale about Devon, not only because if the sales for the revamped versions goes well, there'll be more books, but also because it's just a great story. Enough ranting! Below you can find descriptions of the books and links to buy them and more info about the books. Buy them! Enjoy them! You can buy the first book "Sorcerers of the Nightwing" HERE! (It"s a bargain and really worth it!). 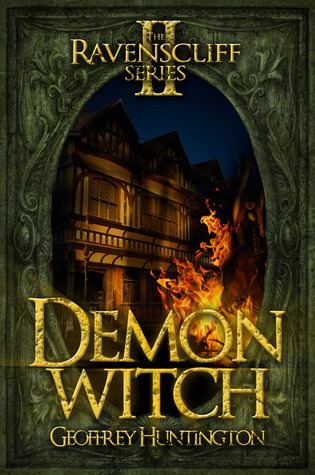 If you loved the first one and you can't wait to start on the second one, "Demon Witch", you can buy it HERE! And here's a blogpost from the author on Goodreads. Every kid fears the monsters in the closet -- but for Devon March, the monsters are all too real. Horrible things come slithering out across his floor, determined to drag him with them back down their Hellhole. But Devon is no ordinary young man. He can move objects with his mind, summon incredible strength, disappear at will -- and that's only what he has discovered he's capable of so far. Yet his powers -- and the demons in his closet -- remain for him unexplained mysteries. At fourteen, Devon is sent to live at Ravenscliff, a dark seaside mansion, where he learns the first part of the secret of his powers: he is a sorcerer of the Order of the Nightwing, a three-thousand-year-old tradition of mysticism and magic that fascinates Devon with its fabled history. But Devon's new family, the Muirs, forbids him from discovering any more about his heritage, inexplicably terrified of what that knowledge might bring. At Ravenscliff, Devon must contend not only with the demons but with a strange, precocious eight-year-old boy who may prove to be the link to the most fearful demon of all: the Madman, who wants to unleash the creatures of the Hellhole for his own malevolent gain. Ravenscliff is built over one of the largest Hellholes in the world, and the uninitiated Devon must fight off the demons with the help of his new friends from Misery Point High -- including the dazzling Cecily Crandall, raised at Ravenscliff and the holder of a few secrets herself. "Sorcerers of the Nightwing" marks the debut of a compelling new fantasy-horror series, evoking a richly detailed and fully realized world of sorcerers and mystics, haunted houses and shadowed terrors, and the ever-present threat ofthe ancient creatures of the Hellhole. Devon March matches wits and wizardry against a five-hundred-year-old evil in Demon Witch, the spine-tingling sequel to Sorcerers of the Nightwing. Long before the days of Madman Jackson Muir, a witch named Isobel the Apostate waged war upon her fellow sorcerers, the noble order of the Nightwing. Burned at the stake for her crimes, Isobel vowed to return and conquer the world. Now that she is back, the only person who can prevent hell on earth is fourteen-year-old Devon March. In a battle that takes him from modern-day Ravenscliff to Tudor England and back, Devon must unleash the Nightwing power within himself and call upon friendships in the strangest places to stand against an evil that has waited five centuries for revenge. For at Ravenscliff, friends come in all shapes and sizes -- and enemies are everywhere. Book 3 will be released on Halloween this year in English! I'm thrilled for all my fellow fans that didn't get the chance to read this part of the story. Now they'll finally be able to read what I did all those years ago. I can only find French and Dutch descriptions and I don't want to translate it myself because it'll probably sound horrible if I do so. But if you loved the first two books, you'll definitely love this one too.